Somewhere at sometime, I heard a preacher say, “God moves mountains”. Why should that impress us? Where does the phrase “God moves mountains” come from? 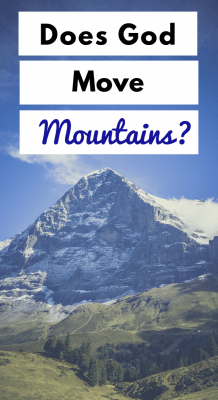 Are there Bible verses about mountains? 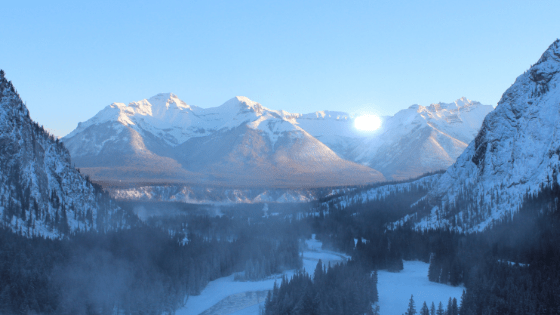 Why does God moving mountains matter to us in our everyday lives? As an outdoor lover and nature photographer, the beauty and majesty of mountains often capture my attention. I recall one early morning, I went out to photograph bull elk in the Colorado Rockies during their rutting season. The massive bulls make for great photographs as they clash with each other and pursue females. As I watched the elk, I noticed the sun striking the surrounding mountains. The lure of the mountains drew my attention away. I took my attention off the elk and began photographing the mountains. I could not resist them. Their striking power and majesty called to me and I responded. John the Baptist quotes this passage to announce the coming of the Messiah, Our Savior, Jesus. Mountains are barriers and Isaiah 40 uses leveling mountains to explain that Jesus removes the barriers to our salvation. Praise God! When we trust Christ for our salvation He is powerful enough to move mountains. No sin can hinder the saving grace of God! In Isaiah 45 and the Book of Ezra, God gave the Persian King Cyrus a task and God Promised He would be with him. Isaiah wrote a prophecy to Cyrus 200 years before Cyrus ruled. In that prophecy, God told Cyrus that he will prosper. The Lord declared to Him, “I will go before you and level the mountains.” God used mountains metaphorically to let Cyrus know that nothing or no one could stand in his way. Today, when God gives us a task, He will be with us. In His timing, He removes the barriers that would keep us from accomplishing the task He gave us. If God calls us to do something, we can be confident that if we pray, trust and follow His path, He will get it done. No task stands as an unmovable mountain before God! Amos 4:13 declares, “For behold, He who forms mountains, And creates the wind, Who declares to man what his thought is, And makes the morning darkness, Who treads the high places of the earth, The Lord God of hosts is His name.” (NKJV) So If God created mountains, He certainly can move mountains. In both Matthew and Mark, Jesus mentions speaking to the mountains to move them. While as the God-man on earth Jesus never moved a physical mountain nor did anyone else in the Scripture (although Jesus did command the weather). From this, we can surmise that God is not calling us to change the physical landscape, but He does call us to do great things by faith in Him and change the spiritual landscape. In Matthew 17:20 Jesus says, “So Jesus said to them, “Because of your unbelief; for assuredly, I say to you, if you have faith as a mustard seed, you will say to this mountain, ‘Move from here to there,’ and it will move, and nothing will be impossible for you”(NKJV). It’s clear the key here is not the size of our faith, but Whom we place our faith in. God moves mountains! If He calls us to move a mountain, that mountain will move when we act and trust in Him. He doesn’t call us to move a mountain, that will not move. The Bible verses about mountains do not directly declare, “God moves mountains”. The phrase does not appear in the Bible. What the verses do reveal is that God has authority over both physical and spiritual mountains. So if he has authority over them he certainly has the power to move them. Do you see mountains in your life? If God wills for that mountain to be moved, He will do it. Our part is to pray, seek Him, trust and take action. How has God moved mountains in your life? Has He moved any financial mountains for you? Let us know in the comments. About the Author: Pasquale Mingarelli is a longtime professional photographer and photography instructor. 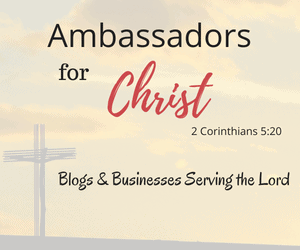 He speaks on creation through the eyes of a photographer and runs The Visual Bible Verse of the Day website. On that website, you can download his free pdf “15 ways to Encounter God in the Outdoors”.